Kramer's PixPerfect Scaling Technology - Kramer's precision pixel mapping and high quality scaling technology. High-quality 3:2 and 2:2 pull down de-interlacing and full up- and down-scaling of all video input signals. State-of-the-Art Video Processing Technology - For highest quality de-interlacing, noise reduction, and scaling performance for both standard-definition and high-definition signals. K-IIT XL Picture-in-Picture Image Insertion Technology - Ultra-stable picture-in-picture, picture-and-picture, and split screen capability. Any video source can be inserted into or positioned next to any other video source with full window positioning and sizing controls. Ultra-Fast Fade-Thru-Black (FTB) Switching - Video switching transitions are clean and ultra fast. The video fades to black and the new input fades from black for smooth, glitch-free switching. The output signal provides constant sync so the display never glitches. HDCP Compliant - The HDCP (High Definition Content Protection) license agreement allows copy-protected data on the HDMI input to pass only to the HDMI output. 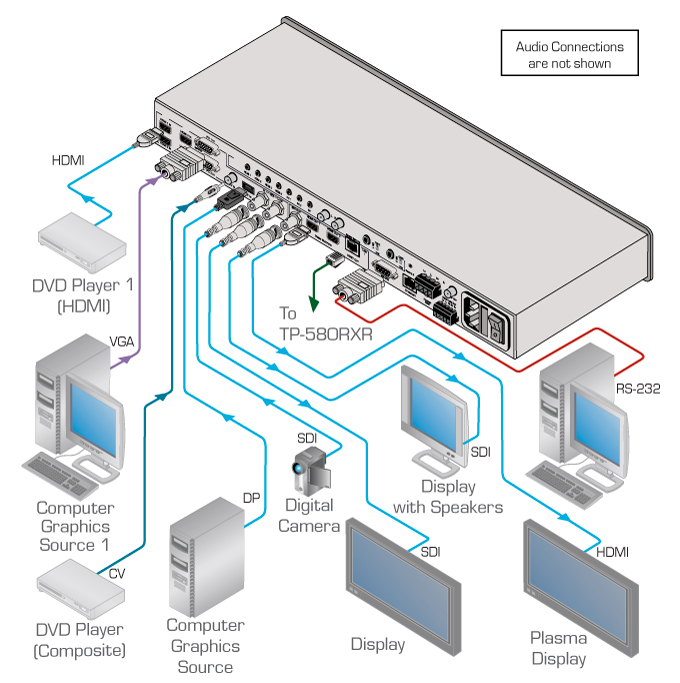 Scaled Outputs - 2 HDMI, 1 HDBaseT, 1 3G HD-SDI (all outputs work simultaneously). Max. Data Rate - 6.75Gbps (2.25Gpbs per graphic channel). Advanced EDID Management - Per input; analyzes the EDID of a selectable Master connection to one of the outputs. Range - Up to 130m (430ft) normal mode; up to 180m (590ft) ultra mode (1080p @60Hz @24bpp) when using BC-HDKat6a cables. Output Resolutions - HDTV and computer graphics up to 2K and 1080p/UXGA with selectable refresh rates. Multi-Standard Video Support - NTSC (3.58/4.43), PAL (M/N/60) and SECAM with advanced de-interlacing options. Built-in Proc-Amp - With enhanced functions such as color correction, gamma and dither. Audio Support - Unbalanced stereo audio inputs, with two microphone inputs; digital stereo and balanced stereo outputs; input and output audio level adjustment. Automatic Detection and Selection of Embedded Audio - Automatically outputs the signal from the HDMI and DP embedded audio inputs or performs an analog takeover to output the respective analog audio input. Selectable Power Save Modes - For efficient energy use. HDMI Deep Color Support - For all inputs and outputs. Picture Zooming - Both on main and PIP window from 100% to 1600%, including separate V and H sharpness control. On-Screen Display (OSD) - For easy setup and adjustment, accessible via the IR remote control and via the front-panel buttons. Firmware Upgrades - Via Ethernet and RS-232. Flexible Control Options - Front panel buttons, OSD (on-screen display) via front panel buttons or IR remote (remote control included), embedded Web server. Mass Notification Emergency Communication System (MNEC) - Activates a national or campus-wide notification, immediately displayed when an emergency situation develops. It uses automatic text overlaying, either via a crawler or a full screen cover up, as well as an optional audio alert. Multi-Standard SDI Support - SDI (SMPTE 259M), HD-SDI (SMPTE 292M) and 3G HD-SDI (SMPTE 424M). Audio Amplifier & Speaker Output - 2x10W. Microphone Inputs - 2 dynamic or condenser (with 48V phantom voltage).